SEOUL, South Korea — Secretary of State Mike Pompeo said that in his meeting with Kim Jong-un on Sunday, the leader of North Korea had agreed to allow inspectors into a key nuclear testing site that the North has claimed it blew up, a down payment on the country’s commitment to denuclearize the country. The two men discussed “the upcoming second summit” between Mr. Trump and Mr. Kim, refining options for the time and place of the next meeting between the two leaders, said Heather Nauert, a State Department spokeswoman. But no date or place was announced. The office of President Moon Jae-in of South Korea, who was briefed by Mr. Pompeo after his North Korea trip, said that the United States and the North had agreed to hold a new summit meeting between their leaders as early as possible. But American officials appear hesitant to give Mr. Kim the kind of power-enhancing legitimacy that he extracted from his meeting with Mr. Trump in Singapore, in June, without first seeing significant steps by the North to account for, and ultimately dismantle and ship out of the country its nuclear weapons and materials and its long-range missiles. On Sunday, Mr. Pompeo said nothing about making significant breakthroughs, except for the North’s agreement to allow inspectors into Punggye-ri, a network of underground tunnels where the North has conducted all of its nuclear tests, including one last September that it claimed was a successful test of a hydrogen bomb. Missing from Mr. Pompeo’s account of his two-hour meeting with Mr. Kim, which was followed by a 90-minute lunch, was any mention of the first step toward denuclearization: an inventory from the North of all its nuclear weapons, its production and storage sites, its missiles and missile launchers. The United States has said that list would form the basis of determining whether the North was being truthful — Washington has compiled its own list, based on intelligence sources — and to set a schedule for dismantlement. The North has dismissed that call as an effort by the United States to collect a list of potential targets should it seek to attack Pyongyang’s nuclear facilities. It has demanded starting with a peace declaration, formally ending the Korean War. That proposal has been embraced by South Korea, but not by the Trump administration — even though Mr. Trump is said to have told Mr. Kim in Singapore that he would move forward with the idea. The inspections of the nuclear site could be significant, if they go ahead. North Korea blew up the tunnels an Punggye-ri in late May, inviting cameras to witness the explosion. But the pictures did not make clear whether the destruction was limited to the tunnel entrances, which could be cleared later, or included the tunnels themselves, where the nuclear tests occur. The statement from the State Department did not say who would conduct the inspections. The International Atomic Energy Agency, the United Nations’ nuclear watchdog, takes inventory of nuclear fuel and fuel-producing equipment, but does not usually deal with nuclear weapons or test sites. The United States would want to send its own nuclear weapons experts, but the North knows that they could take samples from inside the chamber that could reveal critical details of the North’s program, including whether the tests were of uranium or plutonium bombs, and whether the North was telling the truth when it claimed to have detonated a far-more-powerful hydrogen bomb. If the inspectors were not from the United States, they would almost certainly have to come from one of the four other declared nuclear weapons states: Britain, France, Russia or China. 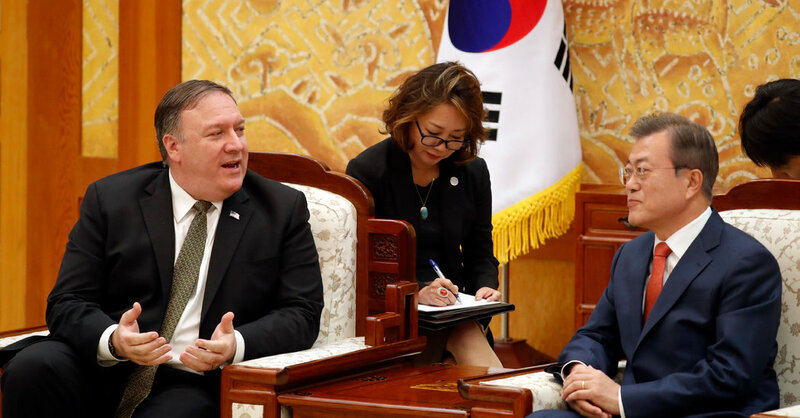 In Pyongyang, Mr. Kim and Mr. Pompeo were more limited in their enthusiasm. “It’s a very nice day that promises a good future for both countries,” Mr. Kim said through an interpreter from the dining table where the two men had lunch. Later Sunday, Mr. Pompeo arrived in South Korea, where he told Mr. Moon, the South’s president, and other officials that he had had a “good, productive conversation” on his fourth visit to Pyongyang. Yoon Young-chan, a spokesman for Mr. Moon, said that during Mr. Pompeo’s trip to Pyongyang, the secretary of state and Mr. Kim had discussed the steps that North Korea would take toward denuclearization, as well as “corresponding” measures that Washington would undertake as incentives for the North. The two sides are expected to soon hold working-level talks to set the details of the planned meeting, said Mr. Yoon, to try to ensure that the second summit, if held, will be a success. Seeing Mr. Pompeo off on Sunday, Mr. Kim said he hoped that both sides will work out a “good program” for the next summit, “based on the deep confidence between the top leaders of the two countries,” the North’s official Korean Central News Agency reported Monday. At the Singapore summit, Mr. Kim committed to “work toward the complete denuclearization of the Korean Peninsula.” In return, Mr. Trump promised North Korea security guarantees and “new” relations. But talks over denuclearization have since stalled. And Mr. Trump’s critics have charged that his eagerness to claim progress in resolving the North Korean nuclear crisis, one of the most urgent problems he inherited from the Obama administration, has blinded him to the country’s deceptive nature. North Korean officials who dined with members of Mr. Pompeo’s entourage in a separate room had said that it would be great if Mr. Trump visited Pyongyang for a second summit meeting with Mr. Kim. But there is no sign that North Korea has changed its decades-old negotiating strategy, which often involves making pledges that it fails to carry out. Speaking to the United Nations General Assembly last month, its foreign minister, Ri Yong-ho, said that although his government’s commitment to denuclearization was “solid and firm,” there was “no way” his country would unilaterally disarm unless Washington took steps to demonstrate that it is no longer a threat. Noting continuing American hostility, Mr. Ri cited Washington’s campaign to escalate sanctions against the North and its refusal to declare an end to the Korean War, which was only halted with a truce. Past nuclear talks between North Korea and the United States had fallen apart over how to verify that the North had owned up to all its nuclear activities.